At the time of writing this report, it’s the middle of august 2018. This puts us ten months into this 2017 Solar Return. 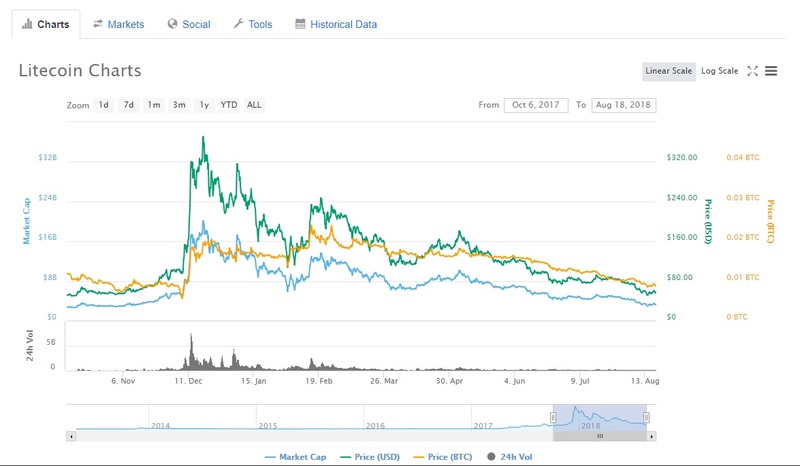 The idea and intention of this report is to observe the aspects presented by the charts and then relate that to what can be observed to have happened to Litecoin during this same period. The ultimate goal is to find correlations between the aspects and what we observe so as to be able to apply this understanding to the forward-looking Solar Return for 2018. After reviewing all the information below, here is the summary. 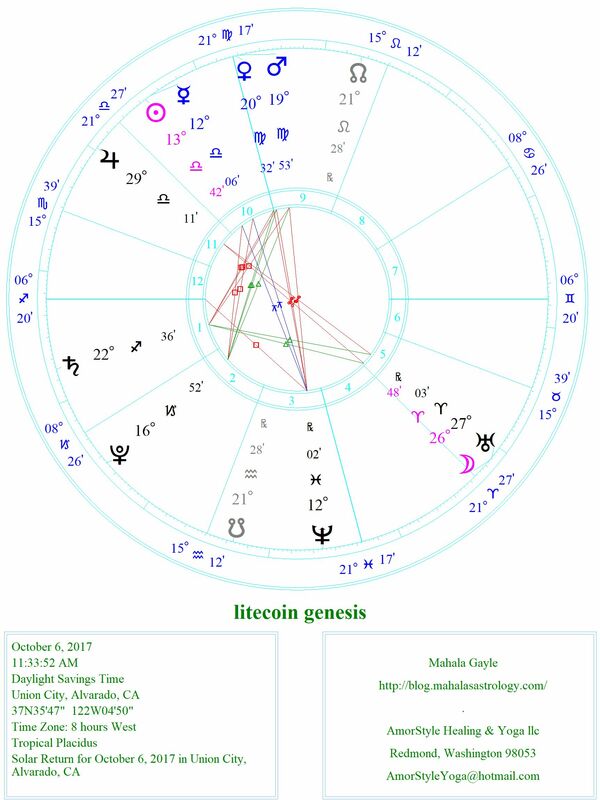 To me, the Solar Return chart highlights the very strong desire behind the leaders running this crypto-currency to really get down to work and make their reality happen. They want desperately to get a working system that meets their expectations, but the chart is littered with obstructions and restrictions. The people participating in the project are emotionally tied to making money. This is the big gamble. They are looking for the technological transformation to come out of this project and expect it to pay off big. The problem is that the gamble is squashed by Jupiter and is treated as another big lesion to those that took the chance. The passion and drive to really put together something that shines for everyone to see has lots of energy but it’s being forced to happen rather than simply falling into place. This very passionate drive to really deliver what the world needs, is up against strong resistance that will test the emotions of everyone participating in the activities. During the year, all the people that jumped into the hype during the bull market in the fall are now sitting underwater with regards to their investments. The gamble for riches hit the resistance of Jupiter. Just after the bull run last fall, word circulated that the founder sold all his coin into the strength of the market. This lead to fear and uncertainty that many found hard to comprehend. The big announcement and hype that the leaders of the community pushed that was related to LitePay jazzed people up and then crushed them as that deal could not deliver what the market was expecting. The Anarchapulco conference that happened in mid-February turned out to be very favorable for Litecoin and that conference turned out to be the key conference so far for the year. The main takeaway was that everyone should own Litecoin. You could see and feel the excitement from the social influencers that talked about it after the conference, but they really couldn’t explain it to the viewers and the energy has simply faded. Recently, the Litecoin foundation has purchased a 10% stake in a German bank. This is another situation where the leaders of the project have made a decision that is rather significant that they have failed to be able to adequately explain to the participants in the system. It’s a ‘trust us’ type of situation. This will probably bring up the darker elements in this chart that have yet to really been seen. 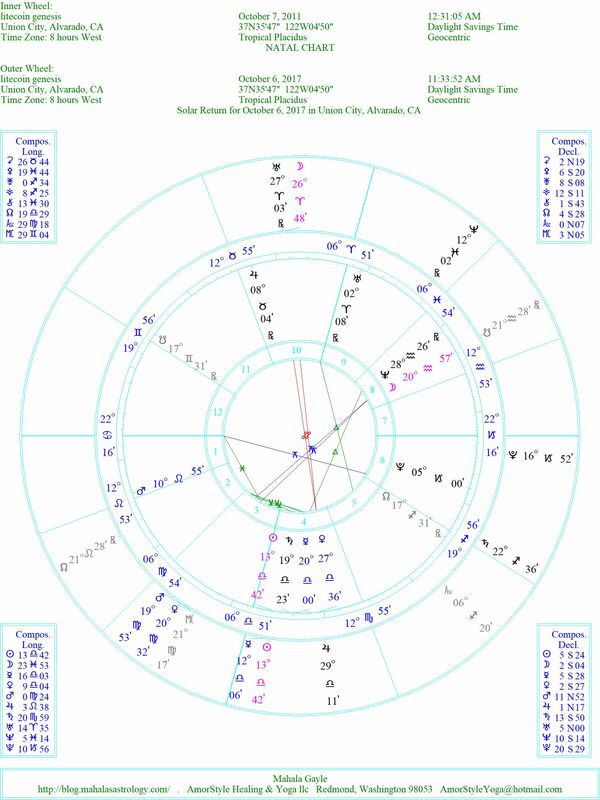 Overall, it seems to me like the influential energies described in this Solar Return could be seen and did apply to what was seen during the year. It will be worthwhile to investigate the next Solar Return so it can be mapped closer throughout the year. If you would like to see how I came to these conclusions, please feel free to read through the analysis that follows. 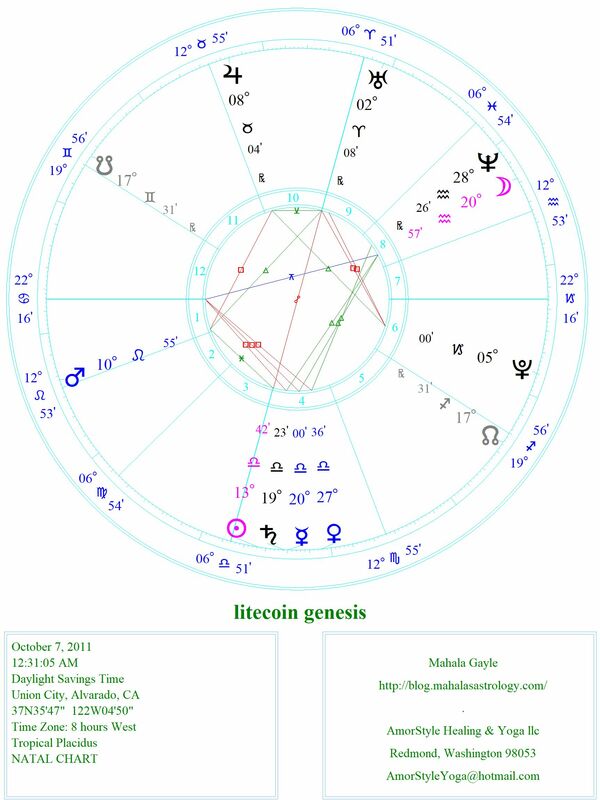 Please see my article Picking Litecoin’s Birth Time for an explanation of how I determined the birth time of Litecoin. Here is that time. Solar Return chart for 2017. Let’s look at all the major aspects that act directly on the leadership of this community. 10th House: Drive and desire to get involved with intent. This is about choosing to do something rather then being told to do something. Conjunction: Energies work together, combine and magnify observable events. Pluto: Transformation, underworld, secrets, what is hidden. There are three clear aspects of influence on the key movers and shakers in the Litecoin leadership. The first one brings to the forefront how the leaders of the community communicate what they do. Everything that is said or done by the leaders will be closely monitored, dissected and scrutinized. The Leaders will have a very strong drive to push their ideas forward and it will be fueled by their passion. There is a strong inner sense that they are doing the right thing and that this is what they’ve been working towards. I would expect that this year would come with a high focus on building the network. This could be both structurally and intellectually. Keep in mind that the Litecoin project IS a network and communication is fundamental to how it operates as a technology. As an observer, the progress made on the structural enhancements may be harder to see. Outwardly, what is seen has two inharmonious influences that will make it hard for the people that follow this community to really see what is going on. On one side there is this dissident transformational energy that’s sitting in the house of money and values. The leadership is going to have to deal with money issues that fundamental change things or situations. Combining this with the idea of communication, the leaders my have a hard time explaining exactly what they are doing or be seen as acting like criminals, dealing with money in the background, hiding their operations. On the other side, the leaders are also influenced by an aspect that leads to misunderstandings. The influence would drive them to redirect attention where they can make adjustments on the fly and ultimately find it hard to convey that they are good-minded managers of the system. This dissident influence is also sitting in the house that deals with fundamental relationships and the refinements of your skill set. These two hard aspects will challenge the dream of what Litecoin can do down to a fundamental level. The transformations will go deep into the core aspect of what the community is and what it values. This next collection of aspects look directly at how the people will see the situation. Uranus: Right-wing political, innovation, sudden change, anarchy, upheaval, inventors and invention, unexpected events. Aries: Courageous, determined, optimistic, confident to impatient, moody, short-tempered, aggressive. Sagittarius: Generous, Idealistic to very impatient, speaking your mind without regard, promising more than can be delivered. The Moon, representing the people in the community and what their attention will be drawn to, sits in a near perfect conjunction with the energies of technology, invention and upheaval. The people’s attention will be drawn to sudden changes and there should be right-wing political influences. Being conjoined in Aries, gives the union a determined, courageous, fighting spirit. If that energy gets pushed too hard, the people will get impatient and short-tempered. They will not seriously think about what they are doing, but they will jump in with both hands and feet. This conjunction is fed by the energies of the 5th house which will make the people feel like they are joining the cause. It brings with it speculation and the willingness to gamble. The people will feel like it’s all about how the community is seen and how it presents itself. There are two major accentuating influences that will color how the people are willing to speculate on this project. The hardest one is the opposition which puts the speculation directly at odds with wealth creation. Jupiter is sitting in the house that represents the culmination of working your dreams and accomplishing your goals, thus it’s directly in opposition of the speculators expectations. This suggests that speculating for wealth is probably not the right thing to do here. In what looks like an uplifting situation, yet it isn’t, Saturn sits trine the people’s wants and desires. The restrictive, structured energy, that brings rules & regulations which lead to lessons learned is open to flow directly towards the people in the community. The people will be open to seeing exactly how the Litecoin community works and they will be aware of the core fundamentals, but it brings lessons with regards to speculations – particularly with regards to wealth. This combination would make me think that the people’s attention will be divided between speculation to make money and the core fundamentals of the innovative activities that are taking place within the community. These next aspects show key influences throughout the year. Virgo: Loyal, Analytical, kind, hardworking, practical to worrying, overly critical, all work no play. This next collection of influences links directly into the drive, passion and self-image associated with this project. In a three-way conjunction, we have all the energies associated with Mars, Venus and the Midheaven all working together for the year in an amplified mix. They are sitting in the 9th house which carries with it the full understanding regarding why higher education is needed and how these types of studies benefit everyone. This directly relates to scientific institutions and the corresponding research. This house is about wisdom, being diplomatic and making strategic partnerships. Overall, this house is about doing the work that benefits everyone. What type of work will be done? This conjunction is in Virgo which brings out the analytical, hardworking, practical minded projects. The thing the project will need to look out for is the fault of becoming overly critical of self and what that will mean to the image of the Litecoin community. This energy could also lead to misunderstandings from not being able to full express what is being worked on or that they need to polish things up before they will full accept what they have created as being worthy of announcement. So here we see that all the artistry and passion carried by Venus and all the action, fighting spirit and competition brought forth from Mars which is all unleashed on the nit-picky, detailed oriented work that eventually benefits everyone – but only after they are able to accept that it is up to their standards. Now that we see what the community is up against, well take a look at the direct opposition to these desires that comes from Neptune. This planet is sitting in Pisces which would normally accentuate the compassionate, artistic, intuitive and gentle side of things; particularly those aspects of Venus, yet it’s diametrically opposed to that. We should expect the rough aspects of Pisces to be activated from this aspect. This will bring up fear, sadness, the questioning of things, situations of inappropriately extending trust, being criticized, cruelty and being reminded of failures from the past. As it reaches out to the conjunction that it opposes, we would expect that the dreams and scientific research will be subject to a very emotional doubt filled scrutiny. Keep in mind that Neptune is associated with idealism, socialism, fraud, deception and loss and is sitting in the 3rd house. The 3rd house is the house where things are made more efficient. This is where, what is desirable has been figured out and changes are made in order to refine fulfilling those desires. It’s about learning, refining and polishing. It’s about exploring what is at your disposal that improves communication and enhances relationships. All means of discriminating information is covered by this house. Flipping this opposition around, all the work that Neptune wants to emphasis as it works through this house is being blocked by the Venus + Mars conjunction. This would indicate that all this forward progress that we would expect will find nothing but block after emotional block as the project tries to take advantage of the communication channels over the year. 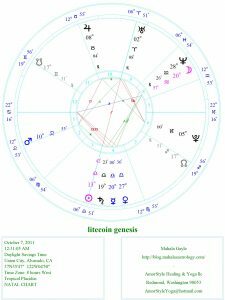 Looking back at the Virgo Venus + Mars conjunction dealing with the idealism and technologies that can change the world, we see that its Trine Pluto. Pluto brings transformations. It rules the underworld or mysteries and is associated with the political undergrounds, espionage, organized crime, great wealth and power and the activities that happen in the background to maintain that power. This planet is sitting in the 2nd house that represents national wealth, revenue, activities involved with making money, banks, exchanges and financial stability. Pluto will be behaving like a Capricorn for the year, so it should be responsible, disciplined and in self-control. It may be serious and possess independence or may be seen as being on its best behavior. Looking at Pluto independently, there will be changes with regards to how the community members see money and wealth. There will most likely be undertones of criminality, but that will not be directed towards the people of the community (some energy towards the leaders) but it could overflow into the work being performed in the scientific institutions or larger institutions that are performing research. This might be hard to see. The last aspect creates blocks or obstacles and this time it’s between Venus + Mars and Saturn. Saturn is in Sagittarius which has weaknesses of promising more than can be delivered, or being very impatient or saying things regardless of the situation or circumstances. It is sitting in the house that relates directly to the people in the community and their general state of being. It’s about reputation, self-governance, law & order. And Saturn itself brings limitations, borders, restrictions, regulations, poverty, death, public sorrow or disappointment. So, when we look at this square, we see more energies that are working to prevent Litecoin from fulling executing on the research that it knows needs to be done in order to find the full expression of the project. The passion and drive that is strong in Litecoin right now is, on one hand restricted by Saturn and the other mired in doubt from Neptune. This section is left as an exercise for the reader. Bi-wheel for Solar Return and Natal chart. Here, I’m looking for any aspects that might trigger key aspects in the natal chart. With an eye towards simplification, the orbs have been reduced to 1 degree in this bi-wheel. When looking at the different aspects, there are two that I’d like to consider. The Uranus + Moon conjunction was covered above showing that the people of the community will have their attention on the technologies throughout the year. The problem is that this conjunction is opposing Venus which is all about peaceful resolutions and being diplomatic when handling situations. The natal Venus is sitting in the house of resources and what you can do with them. As this opposition may bring up thoughts that the community is not using its resources correctly or spending time on the wrong arts. It will hit back at why people got into this project in the first place. The Mars + Venus conjunction that is also covered above is one that is amplified passion and activity. All this energy that is directed towards the scientific research and perfecting that Litecoin is, is in an aspect of complete misunderstanding with the people of the project. Even though the leaders may want the perfect technology to fulfill their desires, the core people are not able to understand. Keep in mind that the natal moon of the people is in the 8th house which is death, financial loss, fatal accidents and the like. The conjunction passion could be seen by the people as being misdirected (as this time) and they (the people of the community) are left to suffer loss and death. Keep in mind that the year that we want to review starts on October 7th, 2017 and stretches to October 7th, 2018. Key data points for the year. The price action can be thought of as fluid and representing the emotions of the people involved in the community. To get an overall feeling regarding what happened throughout the year, I would say the Solar Return shows us that energy. Stay tuned for a similar review of the upcoming Solar Return for 2018. The best part about the next report is that we’ll be able to track it through the year! I would love to run some personalized astrology reports just for you. Please consider joining the Mahala’s Astrology Community by becoming a One Year Subscriber. Keep in mind that when you support us by becoming a community member, you benefit directly. It’s a win-win situation.